“Vichardhaara”, a part of leadership series talk is an event for everyone who aspires to dream and fight back the common. 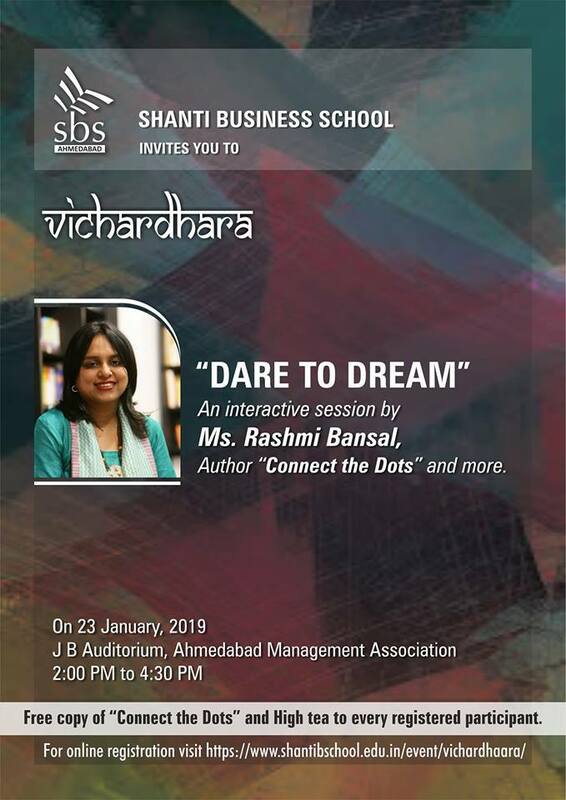 The first of this series is a talk on “Living the Unconventional Dream” by renowned author Ms. Rashmi Bansal. “In the Flock of Pigeons, Dare to be an Eagle.” Come and be a part of thought-provoking insights and learn from the experiences of those who dared to fly against the wind and became successful. The speaker, Rashmi Bansal, is a writer, entrepreneur and a motivational speaker. An author of 8 best selling books on Entrepreneurship which have sold more than 1.2 million copies and been translated in 12 languages, including Korean and Vietnamese. Rashmi Bansal is #1 business book author in India. So, we welcome you to be a part of this exciting talk where what you will learn will last a lifetime. Note: Registration Fee is 100/- Rs., Free copy of “Connect the Dots” and High tea to every registered participant. Click below link for Download Registration Form.